exclusive! Signature Club A Golden Candlelight Finish .21 oz. 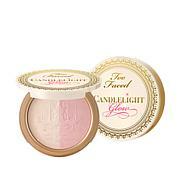 Candlelight finish that brings the look of a reflected glow of candlelight to your face for a lovely, natural-looking radiance. I like this product very much. I have used it in the past and this is a re-order It only takes a little bit to give a lift to my complexion,just a touch too much looks too yellow. HAVE YOU SEEN WOMEN WHO'S HIGHLIGHT LOOK LIKE HEADLIGHTS? NOT CANDLELIGHT JUST ENOUGH HIGHLIGHTS THAT MAKES YOU LOOK LIKE YOU HAVE A INNER GLOW. BEST BEAUTY SECRET, FOR SURE! I use this under my make-up and it diminishes the dark circles. This is by far the best highlighter I have used. The cream formula doesn't settle into fine lines or wrinkles. No fall out. Also works well on lips and eyes. 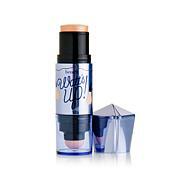 Can be used under foundation for a subtle glow or on top of foundation. 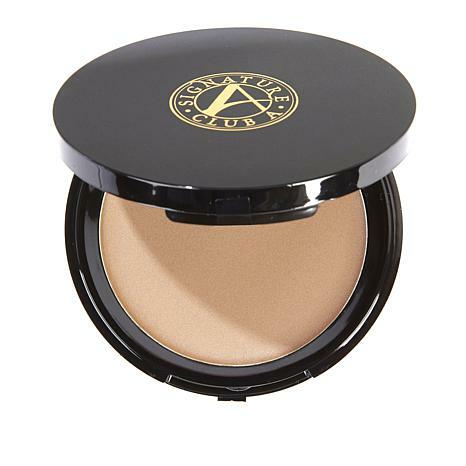 There is a ton of product in this compact, even using daily it will last a year. Highly recommend for mature skin.